Iconic Hair and Beauty is part of The CHAOS Group – a Community Interest Company who help vulnerable, disabled or disadvantaged members of the local community to get back on their feet. Iconic is a fully accessible and inclusive salon, open to members of the public and service users alike. They host events such as Pamper Mornings for Carers; workshops; and currently, The Iconic Academy – a beauty provision in partnership with the Positive People project and funded by the Big Lottery and European Social Fund. The Positive People project is a partnership of eleven Cornish Organisations led by Pluss, who aspire to help Cornwall’s “most socially excluded communities” back into employment, education or training. 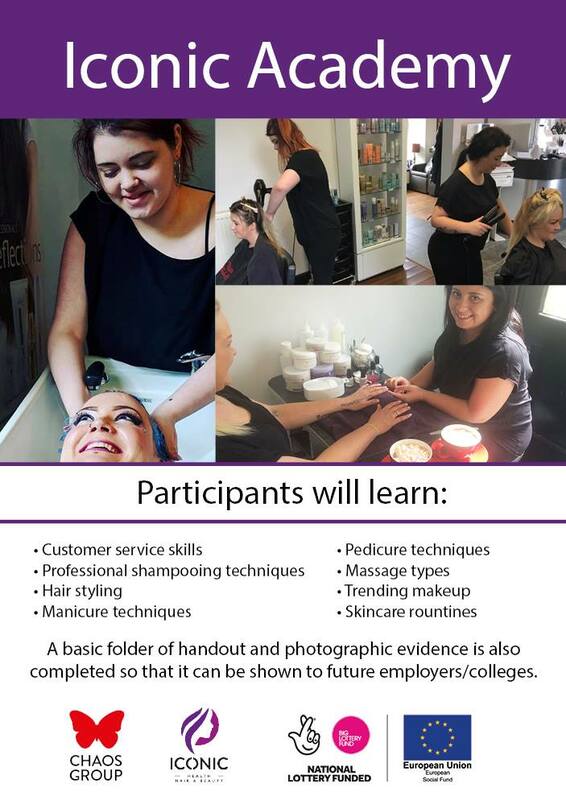 The Iconic Academy is a fully-funded 16-week specialist provision held in the salon, which aims to teach its participants skills such as customer service skills; hair washing; hair styling; professional manicure and pedicure techniques; massage types; trending makeup; and skincare routines. Participants, along with this training and hands on experience, will receive a portfolio of photographs of their work, as well as a completed handbook to showcase their work which they can take to future employers or colleges. The salon is designed to cater for everyone, from accessible wheelchair access and toilet facilities, to the quality of the staff training. The idea behind this provision is to create an alternative pathway for those who are looking for a way into the hair and beauty industry, but often find the conventional route unfitting. One participant could not attend a regular college course to learn these skills because she could not provide childcare, through The Positive People project funding, the CHAOS Group were able to fund her childcare and lead her through the academy course at Iconic. Many of the service users and academy participants struggle with mental health issues and say they find the course increases their confidence and self-worth. To see how the Positive People project can help you get onto the right path back to employment, or to find out more information about the Iconic Academy, call The CHAOS Group on 01872 246724 or email positivepeople@chaosgroupcornwall.co.uk to find out more!